Swill. Last again. I think that's 2 out of 3 years. At least this year my pick is still listed. Thank you John Henry for doing the job again. Shorts ruled the last half of 2018. Congratulation to Billyjoe for winning the Pick of The Year 2018 with SHLDQ for a huge gain of 89.49 percent. Vixt takes second place with RIOT for another huge gain of 89.02 percent. Jiesen takes third place with GBYC also with a huge gain of 74.53 percent. Mrmarket is the only long in the green with a 33.33 percent gain for GLGI. Happy New Year and Thank you everyone for playing this year. 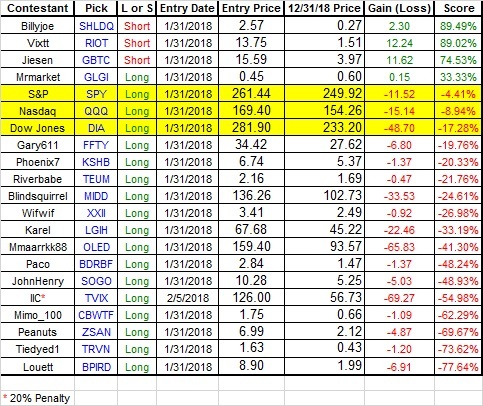 Amazing that even with Sears' final trading day this year being up 60% that the SHLDQ short still managed to take the prize! WTG Billyjoe and Vixtt! and nice picking, $$MM, who manages to find the only long pick to make money here.